One of the major schools in the markets is made up of fundamental traders, who track such indicators as interest rates and changes in the gross domestic product. They also monitor political decisions that have economic implications. A good example of such an event is the OPEC meeting that was held in Vienna this week. Fundamental trading usually operates on longer-term timeframes and aims to profit from ongoing economic developments and cycles. If you are looking at faster timeframes and want to trade from the daily or an hourly chart, then fundamental details are probably not that important to you. However, on big scheduled news events, fundamental traders rub up against the traders who favour the other major approach to trading, the technical specialists, who base their decisions around what their analysis of the charts reveals to them. The big news events like the OPEC meeting touch both fundamental and technical traders. A rule for our trading strategies here at Trade With Precision is that we don’t want to hold a position in a market where economic news is about to hit the wire. Why? Because major economic news usually brings with it huge spikes in volatility: price could be all over the place and the likelihood of our position being stopped out increases 100 fold. So we typically prefer not to be taking a position going into the news event but look to trade the opportunities that could occur after the news break, much like riding the ripples that have been formed by the news. 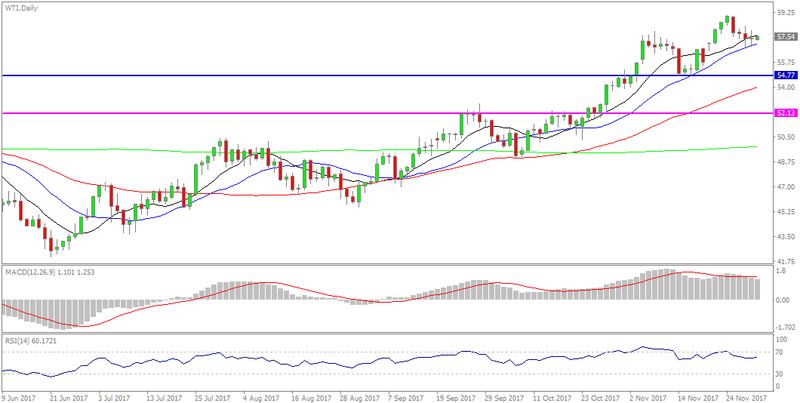 The weekly chart shows that price has been stuck in a trading range between 42 and 52 USD per barrel for most of 2016 and 2017. During a brief period at the end of 2016 and the beginning of 2017, price extended that range to 55 USD/barrel, only to drop back into the range afterwards. At the end of October 2017, price finally broke out of the usual range, tested the 55 level and moved beyond it. Looking at the daily chart, we see that the market is now in a clear uptrend, with price consistently making new higher highs and higher lows. The moving averages have started to show a fanning pattern with clear separation and good space between them. The last perfect trade setup occurred around November 13, when price pulled back into the moving average buy zone and formed a small bullish candle. Since then, the price has continued higher. 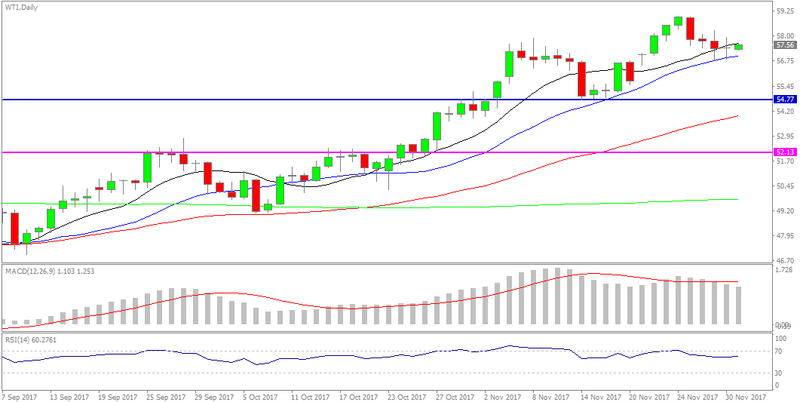 Now the price has pulled back once again into the moving average buy zone and another buying opportunity could be set up with the small bullish candle in the buy zone. The one blemish on this ‘perfect setup’ is that while the price has made a new higher high, we have started to see a divergence in both MACD and RSI, as those indicators failed to make new higher highs. This could be an early warning that the uptrend may not be as strong as it seems. 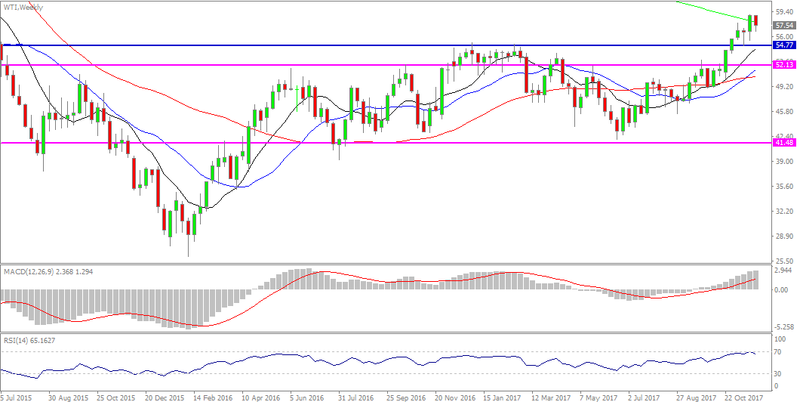 Other than that, the trade setup does appear to be technically sound and may be worth considering as the OPEC news is now done and dusted. Happy trading. And good luck with striking oil. And just in case you wondered where we pick up information about key economic events, we suggest you add our Economic Calendar, which can be found here on the GKFX.co.uk/economiccalendar website.